I recently “misplaced” my cell phone for a few days and was forced to realize how much I depend on this little device to play the cello. This is because my favorite tuner is an app on my cell phone called PitchLab, which I use tune the instrument to a very high degree of accuracy. Although when I lost my cell phone, I wasn’t too worried because I usually just use it tune the cello, and not during actual practice. Besides, I do have other tuners and an old phone with ClearTune on it. However, the extra degree of accuracy on PitchLab was far more important than I realized. It can tune my cello to such a high degree of accuracy that string resonances are easily apparent when I play in tune which allows me to actually practice without a need for a tuner. Yes …my tuner makes my tuner unnecessary. By contrast, when I used my old ClearTune app, I was able to get the strings to within 2 cents of the actual note, but this wasn’t good enough for the sympathetic string resonances to really kick in, so my pitch accuracy during practice was only in the 10 cent range. 2 cents off in tuning leading to 10cents off in the ear? That is what is referred in math as a multiplier effect, and this is caused by missing an audible and tactile cues of string resonance that is in my case apparently more accurate than pitch hearing itself. To be able to benefit from string resonance, at least on my student cello, I need an accuracy tighter than 0.1hz or about 0.5 cents on the A string. So what causes string resonances? Well they are related to overtones. When you play a note, it vibrates at multiple frequencies other than the strongest one (ie the one that shows up on your tuner). These other frequencies (called overtones) will align with the main frequencies and overtones of the open strings causing them to vibrate in sympathy. This causes the whole cello to resonate in subtle yet quite lovely and complex ways which makes the tone much more enjoyable. String resonance is a gentle feedback mechanism that cello players use to tell when they are in tune. The other side of string resonance coin is that when you play slightly out of tune, the overtones won’t quite line up, and the resonances can even work against you causing the cello to vibrate in ways that make the note unstable in pitch or somewhat muffled, particularly when you play the notes in quick succession. This can even happen on a cello that is in tune but being played with bad intonation. On a cello where all the strings are a little bit off pitch, it is impossible not to have negative or misaligned resonances with at least two strings, and if you are resonating with one of them, then you are still playing out of tune and likely messing up your ear! In terms of tone production, misaligned resonances are essentially what creates a wolf note, and a cello that is out of tune is basically playing lots of little wolf notes, but instead of being loud and obnoxious sounding, they will instead be dull, muted, or less stable in pitch or volume. Playing out of tune can make legato notes sound choppy, double stops feel like one string just won’t activate quickly enough, produce dull muted tone, and alter the general response of your cello. Needless to say, playing on a cello that is even slightly out of tune can result in a wasted or at least frustrating practice session, because the response of the cello is so radically different that you might as well be playing with a rubber mute. You could also make a case that playing on a cello that is tuned to equal temperament will cause these kinds of bad resonances on the lower two strings when compared with Pythagorean or Just intonation. This is because, unlike the latter two tuning methods, many notes on an Equal Tempered cello won’t have overtones that are pure frequency multiples of the lower strings, unless you’re playing a basic key like C or D or G where the 5ths will at least be somewhat accurate. I haven’t tested Pythagorean tuning thoroughly enough on my cello to make any solid claims about this, and will have to do a little more experimentation and research. It should be noted that string resonance matters mostly for playing solo music. If you are playing with a piano or with an ensemble, then Equal Temperament is pretty much required, and the resonances will be mostly harmonic ones between instruments and this is happening directly in the wood, the air, and the room itself, and not just between the strings of a single instrument. …After rereading this post, I realize that if my teacher reads it, she will most certainly redouble her efforts to get me to use my tuning fork more often, and I am sure she would be right! This last weekend, I performed The Swan at a recital. Despite the difficulty of the piece and the surprise presence of a microphone a couple feet from my endpin, the 1700 hours of preparation worked, and I managed to not fall flat on my face. Yo Yo Ma, I was not, but honestly, I cannot imagine how I could have played it any better at this point in my cello career, and in many ways I felt like I played it much better than I have any right to at my age and experience level. Yet it was not a fluke either, and I know that my ability to expressively control my tone has improved rather dramatically since my recording of the Minuets. In the weeks leading up to the performance, I was beginning to feel increasingly confident that I finally stumbled upon a recipe to consciously improve the sweetness and sensitivity of my tone rather rapidly – or at the very least, decrease the raspy clumsiness. During this time of preparation, I have been writing and adding details to this post, but I wanted to wait until I tested these practice techniques in a public performance before I posted them here. DISCLAIMER: THE FOLLOWING INFORMATION HAS TRANSFORMED MY TONE, BUT BEAR IN MIND, THESE ARE MERELY THE MUSINGS OF AN ENTHUSIASTIC AND CURIOUS AMATEUR. IF ANYTHING YOU READ HERE DISAGREES WITH YOUR OWN MORE EXTENSIVE EXPERIENCE AND/OR YOUR TEACHER’S INSTRUCTION, PLEASE DISREGARD IT. Begin by lifting the bow off of the string and then lowering it slowly until it makes contact again. Now wiggle the bow back and forth across the string in tiny movements, less than a millimeter. If the bow pressure is too light, the hair will slide over the string making a small raspy hissing thin sounding tone. However if you use too much pressure, the hair will latch onto the string and you will hear an audible accented “chirp” or “crunch” sound if you continue the motion into a full bow stroke. In between these two extremes of force is a “Goldilocks Zone”, where the hair just barely latches onto the string during a micro-wiggle. At this precise minimal pressure, if you continue the motion into a full bow stroke, the string will activate smoothly and cleanly without hiss or scratch or chirp. Voila! You have found the pressure needed to make a string sing without making it cough first. 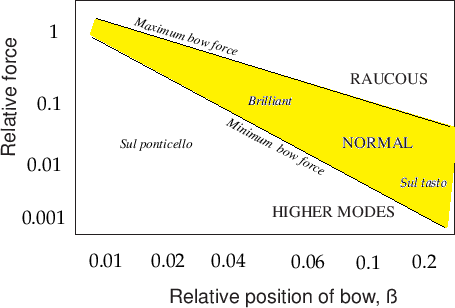 It’s important to note, that the amount of force required varies greatly depending on the stroke you use, the position of the note, the part of the bow used, the bowing direction, speed, acceleration, and other physical parameters (rosin build-up, string thickness, etc) As a result of this exercise, I am also far more aware of my bow speed and am now using a small fraction of the rosin that I used to. I recently had the opportunity to rehabilitate my bow hold. Without going into the details, which in all likelihood don’t apply to your unique grip, I discovered that much of the issues of handling the bow with accuracy revolve around maintaining leverage. You will notice this if you try the previously mentioned exercise of lifting bow off the string and slowly lowering back down again at various parts of the bow on either side of the balance point. Go ahead and try it right now both at the tip and at the frog. Notice what is happening in your index and little finger when the bow is lifted. Notice what happens to the angle of the wrist and any tension in your arm or hand. Is the tip of the bow steady when you lift it? Does it flop around a little when the hair leaves the string? Does the grip seem to change when the bow is no longer supported by the string? Does your hand lock up with tension when holding the bow in the air? By practicing raising and lowering the bow to the string at various lengths of the hair and paying special attention to how the weight is transferred between the string and the hand, you can discover exactly what a relaxed and steady bow hold requires. 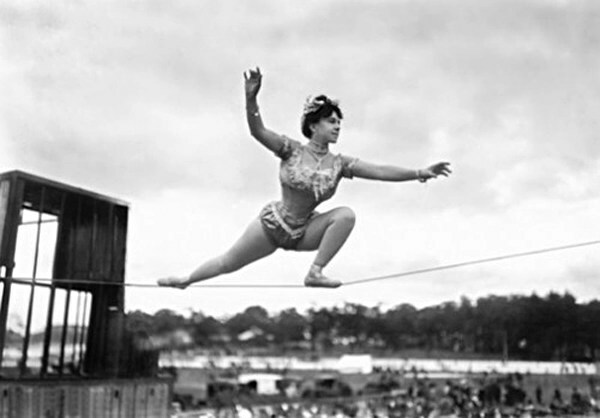 So far, I have found that two things should be true of any bowhold: 1) it should be a relaxed and flexible grip with supple fingers, wrist and arm, and 2) it should be a steady grip that doesn’t collapse, shift, or wobble when you lift it slowly off the string. These two traits will allow you to get a fuller undamped sound from your cello and give you the control necessary to alter the weight in fine increments and smoothly throughout the bow stroke (without bouncing). The amount of bow weight you support and the direction of that support varies dramatically depending on which string you are playing on, the position of the note, and distance of the bow from the bridge. All of this variation can make it difficult to make a consistent sound, however if the dynamics and color of your tone are being primarily steered by the variation in playing conditions, then we aren’t really in control of our tone. One way to regain a measure of control is to try making a consistent tonal color and loudness regardless of contact point or which direction or part of the bow I am using. As my teacher puts it, this is done by varying the bow speed & pressure so that the force the string sees remains constant regardless of the contact point. Of course, the bow will seem much shorter near the fingerboard and nearly endless when playing near the bridge. This consistency drill is an excellent way to work on bow dexterity with direct audio and tactile feedback, while training the ears to really hear these differences as well. It is very easy when doing these kinds of exercises to get into the habit of using too much pressure, especially near the tip of the bow. To correct these habits, simply start over by lifting the bow up and finding the minimum activation pressure again. This is a relaxing reminder, and reassures the body of how little effort is actually needed to make a solid tone. Continuing on the theme of consistency: playing slow is a good idea for getting better accuracy and muscle memory, but it is also a way to improve the fluidity of your tone. When you play slower, you are pretty much forced to move your bow down closer to the bridge just to maintain the same bowing patterns without running out of bow. Playing near the bridge is generally more challenging than playing anywhere else because it requires both deep relaxation, reduced bow speed, and significantly more weight to activate the string in a clean tone. 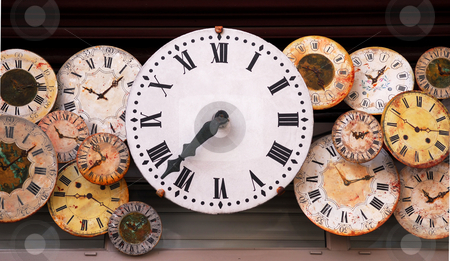 As a result, any sudden changes in speed or pressure are immediately audible as hiccups or gaps in the sound. This is an excellent way to put a microscope on your bowing technique and smooth out any rough spots in your stroke. The ears are the most important tools in a musician’s tool box. Yet our minds are overwhelmed with so many technical aspects of creating sound that our ears are often neglected or ignored completely. This presents a grave problem because playing the cello while focusing only on the visual aspects of your hand position is like driving on the freeway with your eyes squeezed shut. This is because you “drive” the cello with your ears, and you can’t control what you can’t hear. My teacher put it to me this way. There are four progressive stages of acquiring any musical skill: 1) unconscious incompetence, 2) conscious incompetence, 3) conscious competence, and finally 4) unconscious competence. While we move through four stages for any particular dexterity skill on the cello, the degree of consciousness that allows for this journey to take place depends entirely upon the ear’s ability to perceive the countless subtle nuances that become increasingly apparent as we develop musically. The development of the ears depends entirely on how much we are actually relying on them. It will not happen simply as a side effect of practice. It requires intense concentration. Human beings are primarily visual creatures, so it is not surprising that we often try to play the cello with our eyes: watching our hands or looking at a tuner. However, when our eyes are busy watching our fingers or a dancing tuner needle, our ears are operating at a dramatically diminished capacity because the brain behind both of these sensory organs is effectively multitasking. A study at the University of London showed that multitasking can lower your IQ by as much as 10 points. This is a greater mental deficit than losing an entire nights sleep or from maintaining a prolonged cannabis habit. The logical inverse of this finding suggests that playing with your eyes closed could potentially focus the mind enough to effectively raise your “auditory IQ”. This increased “auditory IQ” can be used for both more accurate intonation and better tonal awareness. Owning and using a microphone is possibly the single greatest first step you can make to improve your sound. Maybe I should have put this first on the list? Well, if you don’t have a decent digital microphone like a Zoom HX series or an Apogee MiC, it is possibly the most worthwhile accessory purchase in your musical career besides maybe a metronome. I cannot stress this enough. Without it you might think you can hear how you sound, but you will be wrong. Oh so wrong. Trust me… it’s always better to know. The only downside of having a mic (and it’s a big one!) is the often crushing disappointment when you listen to the first recording of yourself after endless hours on work on a piece. Pleasant surprises are few and far between whenever you hit the record button. However, whatever you discover on the playback, it is simply information. The objective reality is that information itself is neither good nor bad. It is merely a crucial tool to start making adjustments and trying new approaches. It is often during these exploratory adjustments that we can begin to start asking the right questions, so any initial pain or disappointment is well worth the cost in bravery or ego when staring down the red blinking record light. In general, the more you use a mic, the more benefit you will get. But there is a limit. The human ego can be fragile thing when we open ourselves up to new experiences, and the feedback we get can occasionally be like having ice cold water dumped directly into the soul. To ward against drowning my nascent cello ambitions in a bath of ice water, I also devote plenty of time to letting myself soar free of a microphone’s woeful ear, and imagine for several precious minutes that I sound more like Yo Yo Ma. The illusion is tenuous and evaporates soon enough, but I think is a necessary white lie because these kinds of imaginings push me to aspire to things which are far beyond my current capability. In a very real way, this kind of exercise opens a door of possibility that may have remained forever closed otherwise. It also builds up the ego so that it can withstand a few solid doses of tough medicine from a callous microphone. It is especially difficult for unseasoned cellists to keep the bow at a precise distance from the bridge. This distance is often referred to as the “contact point”. Intentionally changing the contact point during a bow stroke is usually done to get a certain tonal color or also during (de)crescendos within a bow stroke. Unintentional changes in contact point tend to produce uneven tone, excessive string noise, and unintended dynamics and tonal color changes. To a certain degree we begin controlling this distance by using our eyes, but as with ear training, we want to eventually graduate to using our other senses. Learning how a steady controlled contact point feels and sounds is the ultimate goal so that we can eventually make subtle intentional dynamic and color changes even with our eyes closed. Perhaps you have noticed that the first time you play a note on the cello its sounds stuffier and feel less responsive than more commonly played notes? This is because the cello has not vibrated in that specific Chladni pattern before. The more you play that note, the clearer and more resonant it will sound as the wood relaxes like a soft old cotton shirt. The process can take years. If you are impatient, there is a device called a ToneRite that can more rapidly “mature” your instrument’s wood by subjecting it to intense vibrations while you are off doing other non-celloy things. I cannot confirm the claims that it opens up your cello safely, however I can confirm that my own experiments with playing loudly into the bridge by hand have altered the overtones of my cello. In general, the amount of resonance a cello has is directly linked to the bandwidth of resonant vibrations for that note and for the resonant frequencies of the wood itself. That means that after years of playing with consistent intonation, those notes will sound more clear and defined when compared to out-of-tune notes, and the more you use techniques like vibrato and double stops, the more depth and warmth each individual note will have. Playing the same note in a higher position (eg playing D3 on the C string) will encourage lower overtones and more depth and warmth in the sound when played in first and fourth positions. Playing an open string D close to the bridge at very high volume will encourage the wood to vibrate with more clarity and with higher overtones. 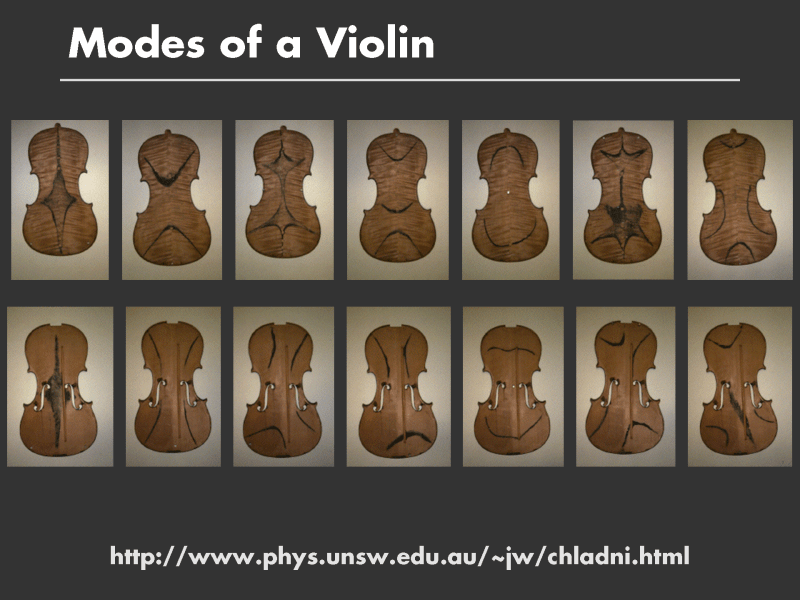 There is some debate as to how much of this effect is caused by the physical properties of the wood being altered, and how much is due to the ears of the musician growing and changing as the skill improves to draw more colors out of the cello. After a grand total of two years and three months behind a cello, I am leaning towards the opinion that it is a good bit of both. A relationship with a cello has been compared to a marriage of sorts, and the more you get to know your partner, the deeper the relationship grows. To extend the analogy further, it is normal and expected that both partners in the relationship will grow and change over time. On a related side note: I just installed a Wolf Eliminator on my cello and I am finding that some of my tonal issues were the result of wrestling with a fairly strong Wolf on the F# that greatly altered the responsiveness of the cello on several adjacent notes and in almost every position. Now my cello is much easier to play on any given note and the evenness of the response makes the notes sound and play much smoother.